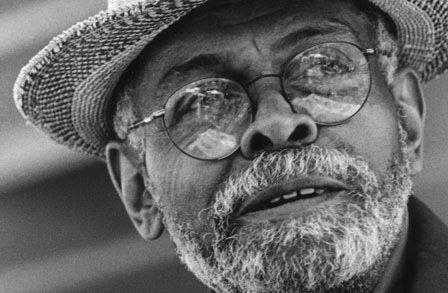 It's not just the shifts from Everett Leroy Jones to LeRoi Jones to Ameer Baraka to Amiri Baraka. It's not just the multi-genre work as poet, playwright, fiction writer, music and cultural historian, and jazz critic. And it's not just the apparent shifting ideologies. Those things are important, sure. But when we focus on just the poetry even, we witness Baraka channeling multiple registers. For now, I'm thinking of "registers" in the musical way where we consider the range of a musician going high and low on various notes. In Baraka's case, the registers could mean the many, diverse tones he was likely to adopt. There were the quiet, touching poems. There were quick, biting poems (think of his low coup). There were poems with militancy, poems with anger, poems with humor. There were poems that featured Baraka screaming (something like his Coltrane poem "I Love Music"). He had poems that he performed with musicians, such as "Something in the Way of Things (In Town)" with the Roots. (That piece carries a haunting tone, by the way). He has whole albums where he performs with musicians, including It's Nation Time (1972) and New Music - New Poetry (1982). But he also has poems where he himself incorporates music such as his humming on his poem "In Walked Bud." In poems like "Digging Max" and "Jungle Jim Flunks His Screen" test, he does all this cataloging. In several pieces, he does something akin to chanting. There are other pieces that seem to allude to political speeches. And of course, there are many of his poems that seem to infuse multiple tonalities and registers. There really was a lot going on in a Baraka performance or "reading." So much so that you had to go rethink how you read him on the page. And like I said, that's just with the poetry. So there's no surprise that so many people have chimed in to comment on Baraka. He tapped into those multiple registers, and people responded.